In these home stretch months before the election, President Obama and Republican nominee Mitt Romney will be repeatedly challenging each other’s economic performance; Obama as President and Romney as Governor of Massachusetts. Already the initial attack ads of both campaigns are running and each has plenty of factual ammo they can aim at the other. Contrary to all common sense, we continue to measure Presidents by the health of the economy. Although Congress is largely responsible for the laws that govern the economic dynamo of a country, we look to the President to set priorities for Congress – or at least that’s what we tell ourselves. In truth, we are rather simple minded and prefer to hold one man responsible rather than a group of 535 Congress people and Senators. 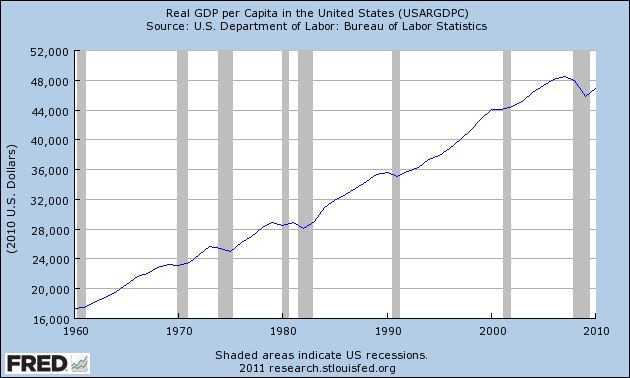 For some background, let’s take a look at a chart showing the real GDP, that is GDP in constant 2010 dollars, per capita over the past five decades. 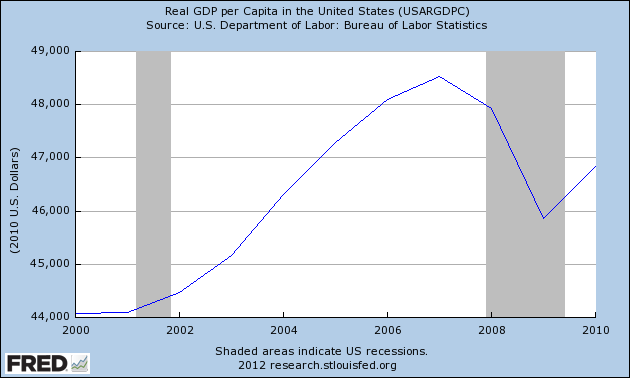 Then zoom in on the last ten years, showing the severe decline of per capita GDP during this recent recession. 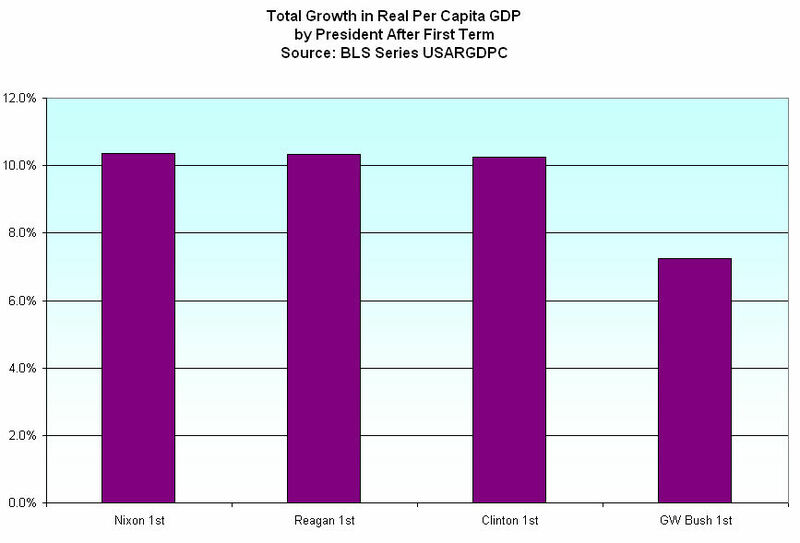 Now let’s look at the total per capita GDP growth by President. If real GDP per capita was $100 when a President took office and $120 when he left office, then total real GDP growth was 20% during that President’s watch. We’re not going to look at the annual percentage of growth, only the total. For the most recent GDP data I have used BEA estimates of $15,454 trillion as of the first quarter of 2012. I have used Census Bureau estimates of a total population of 313 million and a BLS inflation factor of 2.186 since 2010. Almost by instinct, the voters do not re-elect Presidents who are at the helm of a low growth country. 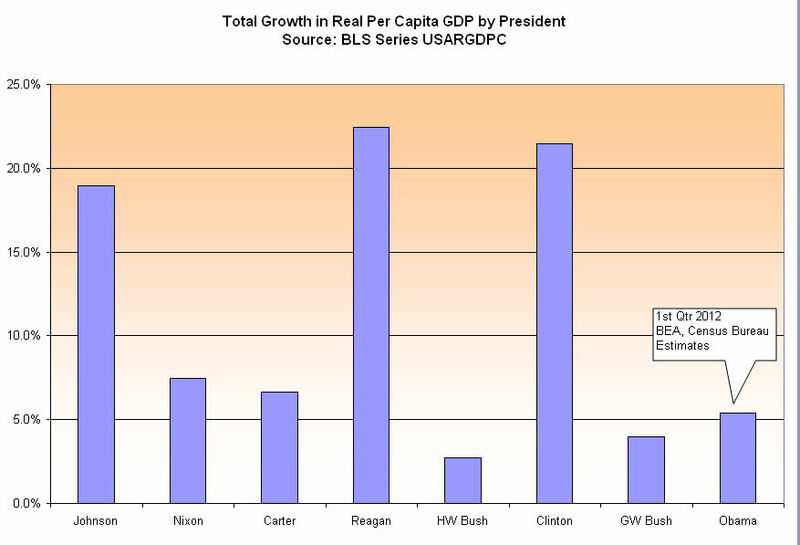 Below is a chart of the first term total real GDP growth of Presidents who were re-elected. I have not included Johnson because he only served for a year before he was re-elected. As you can see, GW Bush was the only President re-elected with a total growth gain less than 10% and Bush won re-election by winning Ohio by two percentage points or 118,775 votes. Had 60,000 voters cast their ballot for Kerry, GW Bush would have lost Ohio’s 20 electoral votes and the election. As the first Presidential election after 9/11, the election focused more on national defense and foreign policy, not the economy. A barrage of attack ads, the Swift Boat campaign, against Kerry in the last weeks leading up to the election proved to be a decisive factor in Bush’s re-election. Had the election concentrated more on the economy, Bush probably would have lost the election. I have listened to several conservative pundits who criticize Obama for continuing to run against Bush’s economic policies, contending that it has been 3-1/2 years since Obama took office. Many conservatives are devotional acolytes of the Ronald Reagan legacy and their devotion often clouds their memory. Obama is using the same strategy that Reagan did in 1984, who ran against Carter’s former Vice President, Walter Mondale. I will paraphrase a common refrain of Reagan during his re-election bid: “Do you want someone (Mondale) who helped get us in this mess in the first place?” Reagan asked. The voters answered a resounding “No” and sent Mondale down to a crushing defeat. Reagan employed this tactic of running against a former President despite the relatively strong growth during his first term. Although Obama’s total GDP growth is better than GW Bush’s total, it is less than former President Carter, a guy who lost his job over relatively weak growth and Obama’s 1st term growth numbers are less than Bush’s first term growth. A strong 1st quarter of economic growth in 2012 has helped pull up the President’s economic growth numbers but the first reading of 2nd quarter GDP growth that comes in July may further weaken his chances just before the election. By the time 3rd quarter GDP numbers come out in October, many voters will have already made up their minds. For his part, Romney’s tenure as governor of Massachusetts was hardly exemplary. We will have two contenders for the Presidency running on an economic platform and neither one of them has a strong record of economic growth while in office. Both campaigns will have plenty of arrows in their quivers and each candidate presents an inviting target. Enjoy the show!